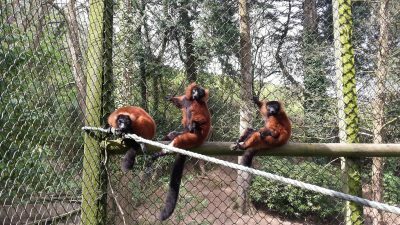 This week’s guest blogger is Jade Price, a primate keeper at Combe Martin Wildlife Park in North Devon, England. 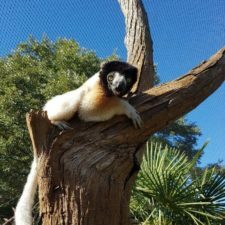 She has the privilege of spending her working life with three amazing species of lemurs, which is just as well because she describes herself as “totally lemur crazy!” This is the second in a series of blogs that will document the many aspects of Jade’s experience working with lemurs in managed care, and the importance of zoos to lemur conservation. 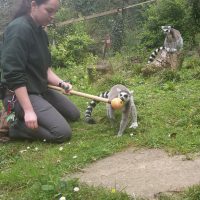 In my last blog post I introduced our ring tailed lemur group and their progress on target training for weighing sessions. As mentioned, this is perfect cognitive enrichment for them as they are intelligent animals. But what works for one sub species does not always work for others. 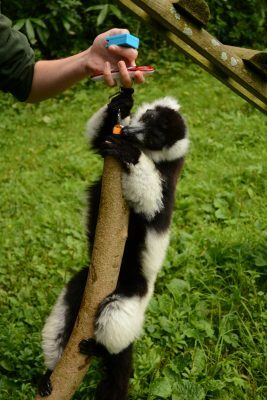 Our other groups of lemurs at Combe Martin Wildlife Park include red ruffed and black and white ruffed lemurs. These two boisterous groups are not suited to the same training style as the ring taileds due to their group numbers – four reds and seven black and whites – all of whom like to bounce, jump and cavort around the enclosure rather than sit quietly, contemplate and observe like the rings. Also, being naturally more arboreal than the increasingly more terrestrial ring taileds, the ruffs are accustomed to life in the trees and are not always sold on ground-based training methods. 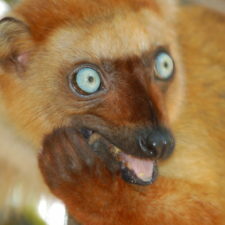 So we needed a different plan in order to get weights for these two groups of lemurs. Cue the wonderful world of social media and encyclopedia that is other zookeepers. One particular post on Facebook caught our eye one day when a fellow primate keeper at another collection in the UK showed a video of their ruffed lemurs on luggage weights. That’s right, your standard luggage weights, used for testing to see if your bags will pass the airlines’ tough weight regulations. These are also perfect for weighing your lemurs. Dual purpose, that’s what we like! The idea is super simple, you just cut a length of branch, screw an eyelet into the top with a carabineer clip and then just attach the luggage weights. 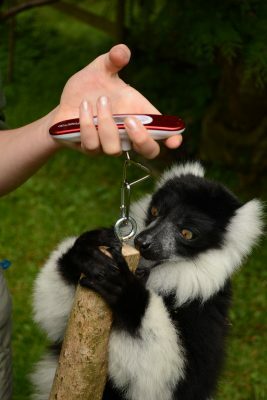 The lemurs are then encouraged to climb the stick when the scales are zeroed and there you go, full-proof lemur weights. Though you must come bearing gifts of course! And here we meet the two food-loving ruffed groups. 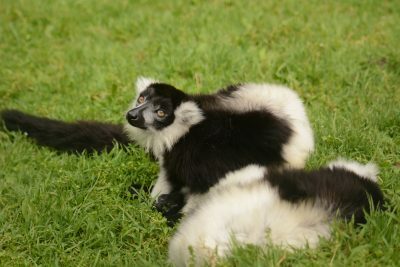 Our group of black and white ruffed lemurs is made up of six males – Felix, Frank, Floyd, Flint, Elmo and Storm – and lone female Froya. As with many lemur sub species the black and whites are female dominant, so although Froya is the only female she certainly still rules the roost over the six boys. No sooner had we entered the enclosure and set up the weighing device the mob descended. Clued to the fact we all concealed food on our persons, gaining their attention was certainly simple! Using a mixture of peanuts and root vegetables we were quickly struggling to get them into an orderly queue for the scales. At first everyone seemed happy to put their hands on the branch but being lifted off the floor put off a few of them. Our bolder individuals – Froya, Flint and Storm – quickly took to the concept and expertly climbed the branch and we were able to take an accurate weight. After a few more attempts we persuaded lower ranking Elmo on too. Higher ranking boys Felix and Frank were totally perplexed by the whole situation and retreated to watch the others squabbling for pole position. Floyd – an individual who loves to be around his keepers for every second they’re in the enclosure – was surprisingly not keen to get up on the branch. Very unusual considering we are normally treated like the trees in the enclosure! We would need to work on him a little more. During later training sessions the problems of working with higher thinking mammals arose, as Froya decided that climbing up the keeper to get to the food in their hand was much easier than hanging her fluffy body on a branch and burning energy. 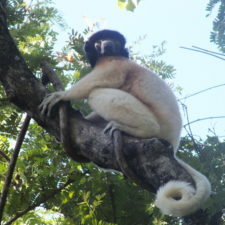 The issue was exacerbated when Storm, Elmo and Flint cottoned on to Froya’s cheat technique; soon we had lemurs using that classic feeding position of hanging upside down to sneak their way over on ropes and branches to drop down and pinch the goods. Great for encouraging natural feeding behaviors, not so great for training. That and Floyd had figured out the peanut pocket in my training belt! This was going to be a three keeper job! Though very similar genetically to the black and whites, the park’s red ruffed lemur group are thankfully a slightly calmer group of lemurs. Making up the troop we have dominant female Mabel, and family group comprising of sisters Suzzie and Stevie and brother Madison. We applied the same weighing technique to the red ruffs as we did with the black and whites. The initial response was very different however. The training stick was met with lots of characteristic low rumbles and alarm snorts as the group tried to figure out what the object was. After the suspicion had worn off and the concept of food highlighted, certain individuals started to pay closer attention. Again a female dominant group, lowest ranking male Madison took the opportunity to step up and claim the rewards ahead of the more hesitant girls. After a few minutes Mabel had sussed that she was indeed missing out on some spoils and so waded in to show how it was done. In that, just like Froya, she cheated. Mabel figured gripping onto keepers and looking adorable was a better shot at food than climbing a stick. Interestingly they proved to be our only lemur group who were not fussed by peanut offerings. Instead we found that solid greens, such as leek, were far more desirable. Once Mabel and Madison had mastered the training concept we turned our attention to sisters Suzzie and Stevie. Stevie really came out of her shell, shrugging her usual shyness and we finally got some weights for her. Suzzie however wasn’t so keen. It’s important to reward any positive behavior that contributes towards the final result you want from your training sessions. In Suzzie’s case this meant giving her a reward for firstly touching the stick, then holding it and finally standing up to reach higher. Though she has yet to properly climb and allow us to weigh her we are steadily getting her used to the equipment and teaching her what we would her to do with it. So keeping our fingers crossed, we will eventually have three sub species of lemurs who are happy to be weighed on a regular basis. 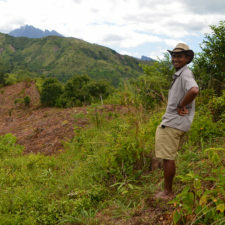 Now that I have introduced all the lemurs to you, in my next blog post I will be touching on what these individuals mean to me personally as their keeper and what I am striving to do to help protect their wild counterparts in Madagascar.